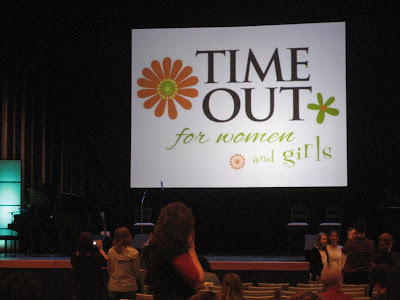 Time out for Women and Girls rocks! 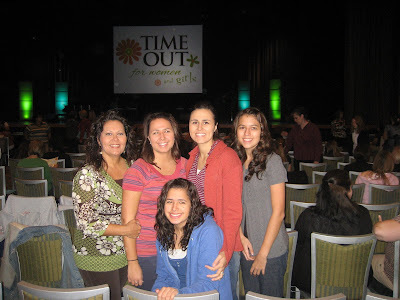 I had the opportunity to go with my mom and my sisters on Saturday and we had so much fun and laughed A LOT! On the Program were John Hilton III, Jenny Jordan Frogley, Laurel Christensen (So funny and such a perfect host), Abe Mills from Jericho Road who gave the best Noah/Follow the Prophet Rap, Cherie Call, and Hilary Weeks. It was an all day event from 9am-3pm but the day just flew by. My mom was totally camera happy which is funny because that's what she usually makes fun of me for, but she kept saying come on girls this will look perfect on the blog. That was ONE of the phrases for the day. :) "Really?" 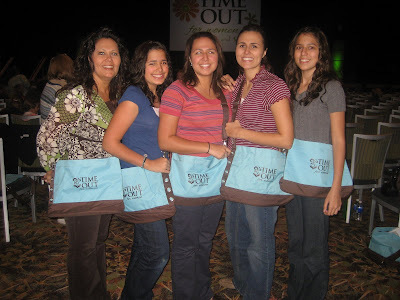 She made us pose with our bags which I KNOW Bailey loved even though they were acting like they were embarrased. 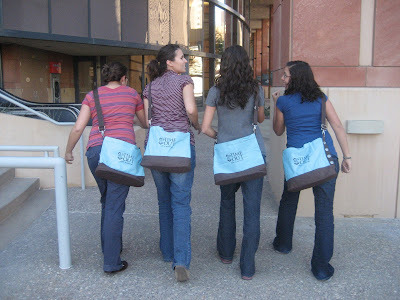 They were the cutest tote bags and we lucked out b/c the host said they don't give them out to the time out for girls events usually but that day they decided to. The host was telling a story about how her and her friends when they hang out together they have a rule that at any point in time someone can just demand a standing ovation and they get one from the rest of the group. 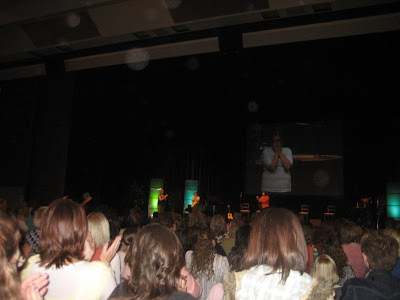 She said its the best feeling b/c how many of us in our lives have actually gotten a standing ovation just for us. She called up a random girl from the crowd and her mom to come on stage and she told her that everyone of us in the room were her sisters and that we all loved her and that this was her moment and her standing ovation so everyone in the huge ballroom stood up and just clapped and hooted and hollered for this cute little 14 year old girl and there was not a dry eye there. The poor little girl started to cry immediately. I don't know if it was b/c she was in a huge ballroom full of strangers or the spirit hit her and the love that she felt (I think the second one) but I know we all sure cried with her it was awesome. You could tell she needed that and that Heavenly Father was definitely aware of her right then in that moment. 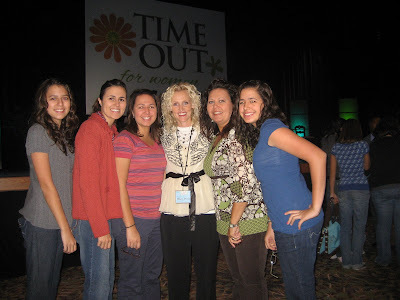 Us with Hilary Weeks who my mom and sisters have met like 8 times before up at General Conference. Cherie Call. Her mom was Brooklyns old Math teacher which is funny. And let me just say her voice was so surprisingly low for someone who sings as high as she does. Alexa and I were getting a kick out of it all day. Sorry for the hand on your shoulder Alexa lol it looks like were taking a prom picture. 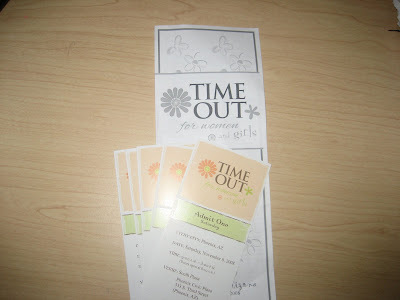 Guess you were my date! haha ya u would make a good prom date!! and yes cheri call's voice is friken loooow!! 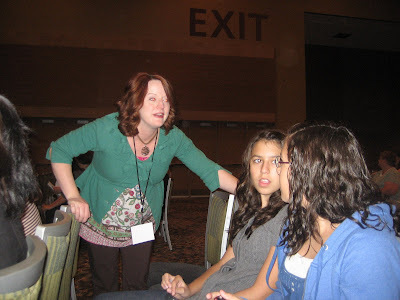 Hey Denee, sounds like you girls had a blast, that is something I will have to talk my mom and sisters into doing next time. And what an awsome story about how everyone was clapping for that girl. Ya I was crying just reading it! Thanks for sharing!